Entering Math by Hand: Enter equations as easily as you would write math with paper and pencil! This feature uses the built-in handwriting recognition in Windows 7. Microsoft Office 2007 & 2010 — MathType Ribbon Tab in Word and PowerPoint: MathType takes full advantage of Office's Ribbon User Interface making it easier than ever to do equation operations in documents and presentations. New equation numbering and browse features work with all Word equation types. Microsoft Office 2003 and XP (2002) — MathType Toolbar and Menu in Word and PowerPoint: MathType adds a toolbar and menu to Microsoft Word and PowerPoint, allowing quick access to its features and powerful commands to do equation numbering, produce great-looking math web pages, presentations, and much more. Color: Use color to highlight part of an equation and focus your audience's attention on just the portions you want. Show what changed in each step of a multi-step procedure and make those equations really come to life. More Fonts: MathType has hundreds more symbols and templates than Equation Editor. Besides our exclusive Euclid™ math fonts, you can also make use of the 1000s of math symbols in fonts already on your computer, as well as other math fonts you can download from the Internet. Here are some of the major new features in MathType 6.7. 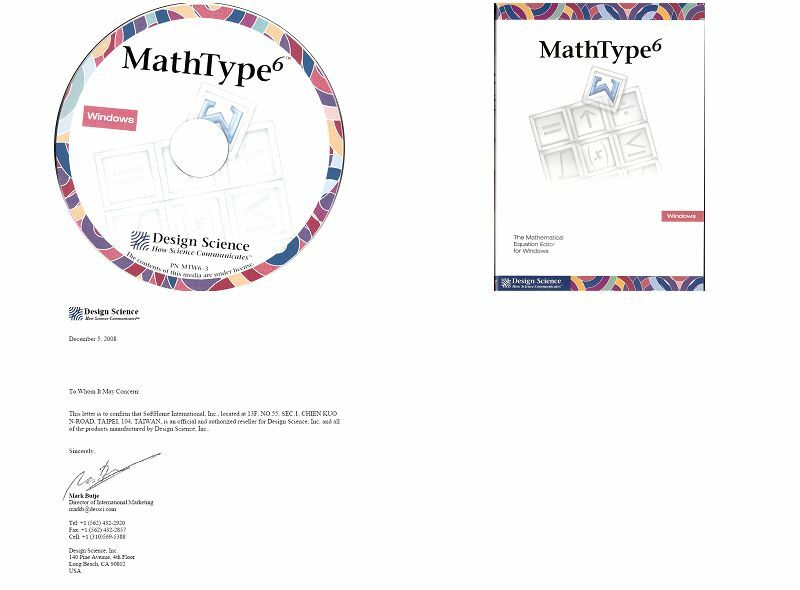 Compatibility with Microsoft Office 2010: MathType works with the latest release from Microsoft, Office 2010, as well as Office 2007, 2003, and 2002 (XP). Compatibility with over 350 applications and websites! Windows 7 compatibility: MathType 6.7 works on Windows 7 (32-bit and 64-bit versions), Vista, and XP operating systems. MathType 6.7 equations are compatible with MathType 6.x and 5.x equations so you can continue to work with other MathType users even if they haven't upgraded yet. When you upgrade to MathType 6.7 any changes you've made in your installed version of MathType, including keyboard shortcuts, toolbars, preferences, etc. will be retained. Here are some of the major new features in MathType 6.5. To learn more about them. Equations Everywhere and Anywhere? 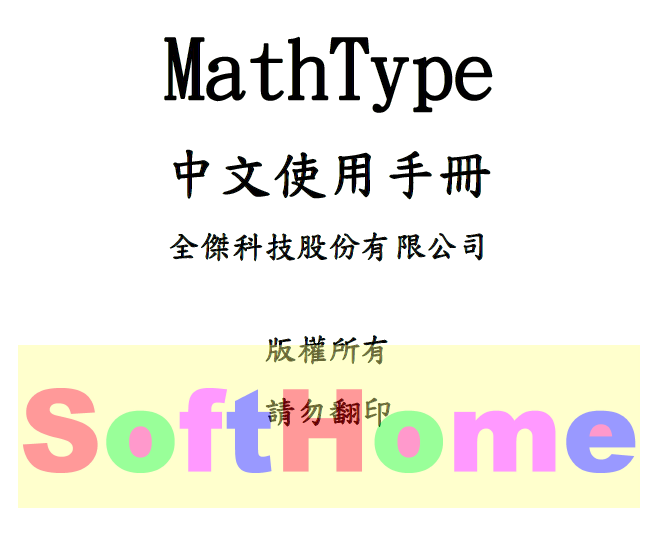 :Up until now, MathType has been thought of mostly as a tool that works with Microsoft Word and PowerPoint. But it has always been much more than that. You can label graphs with equations, create equation images for websites, blogs, wikis, export equations to TeX or MathML, and much more. See Works With ... to see our MathType Interoperability Registry which lists the many, many applications and websites MathType works with. Enter equations in TeX/LaTeX directly in Word: If you know the TeX typesetting language, you can type it directly into your Word document. When you are done, you can use the TeX Toggle keyboard shortcut to toggle between TeX and MathType views of the equation. New keyboard shortcuts in Word to open equations for editing: Many of our customers like to use the keyboard. Now you can open an equation next to the insertion point using a keyboard shortcut. Together with our new TeX Toggle feature, you can now enter and edit equations completely from the keyboard without leaving Word. New translators for Maple, Mathematica, Physics Forum and more: As part of our "Equations Everywhere and Anywhere" effort, we have added new translators for many applications and websites. See Works With ... to see our MathType Interoperability Registry which lists the many, many applications and websites MathType works with. MathML Import: Now you can import mathematics defined using MathML from the many applications that produce it. MathML code can be either in the new MathML Clipboard Format that is supported by a growing number of mathematical and scientific applications or plain text such as from an XML editor, for example. The MathML can be imported via cut and paste or drag and drop. MathType 6.5 equations are compatible with MathType 6.0 and 5.0 equations so you can continue to work with other MathType users even if they haven't upgraded yet. MathType 6.5 will also retain any changes you've made in your current version of MathType, including keyboard shortcuts, toolbars, preferences, etc. Copy and Author Equations from Wikipedia: Wikipedia, the popular online encyclopedia, contains 1000s of pages with mathematical equations. Once you do your research on Wikipedia, you can copy relevant equations for use in your own work. You can also copy MathType equations into Wikipedia's page editor in order to create new pages or edit existing ones. Windows Vista Support: MathType 6 now works on Windows Vista, XP, and 2000 operating systems. While MathType is a mature product that has been around for over 20 years, we continually add new features to help you with your work and to keep current with the applications and websites it works with and your computer's system software. It is important that you upgrade to the latest version in order to take advantage of these enhancements. Here are some of the major new features in MathType 6.7. To learn more about them, visit our Full Feature List. Recognizes handwritten math: If you are using Windows 7 you can use a tablet, mouse, or touch screen to enter handwritten math directly into MathType, Microsoft Word and PowerPoint. Windows 7 compatibility: MathType 6.6 works on Windows 7, Vista, XP and 2000 operating systems. MathType 6.6 equations are compatible with MathType 6.5, 6.0 and 5.0 equations so you can continue to work with other MathType users even if they haven't upgraded yet. When you upgrade to MathType 6.6 it will retain any changes you've made in your installed version of MathType, including keyboard shortcuts, toolbars, preferences, etc. Equations Everywhere and Anywhere™: Up until now, MathType has been thought of mostly as a tool that works with Microsoft Word and PowerPoint. But it has always been much more than that. You can label graphs with equations, create equation images for websites, blogs, wikis, export equations to TeX or MathML, and much more. MathML Import: Now you can import mathematics defined using MathML from the many applications that produce it. MathML code can be either in the new MathML Clipboard Format that is supported by a growing number of mathematical and scientific applications or plain text such as from an XML editor. The MathML can be imported via cut and paste or drag and drop. MathType 6 equations are compatible with MathType 5 equations so you can continue to work with others even if they haven't upgraded yet. MathType 6 will also retain any changes you've made in your current version of MathType to keyboard shortcuts, toolbars, preferences, etc. Color: You can color all or part of an equation to match the color scheme of your PowerPoint presentation, or to draw your student's attention to a particular step in a derivation. 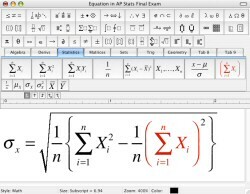 Insert Equation in Word: MathType installs a toolbar into Microsoft Word, giving you the ability to insert mathematical notation inline or centered, with or without equation numbers, with just a click. No need to use Word's clunky "Insert Object" dialog. MathType Commands in Word: The MathType toolbar in Microsoft Word also gives quick access to commands to renumber equations on the fly, insert equation references, or convert a Word document to a web page, all while working in Word. Export Equations: Export all equations in a Word document as GIF or EPS image files for use with web page construction or desktop publishing applications such as Adobe InDesign and QuarkXPress. Insert Symbol Dialog: Lets you explore the many math symbols present in fonts you already have on your computer, fonts you can purchase, or fonts you download for free. You can insert them into your equations with a click or, if you plan to use the symbol often, you can assign a keyboard shortcut to it. Save Word documents as math-savvy web pages: MathType's new MathPage™ feature allows you to save a web page where, unlike Word's built-in "Save as Web Page" command, the equations actually look good. Choose to make your equation a GIF image or MathML, the W3C's XML standard for math. Customizable Keyboard Shortcuts: Work faster by assigning keystroke combinations to your favorite symbols and templates. Unlimited Undo/Redo: MathType lets you undo your editing one step at a time, all the way back to the way your equation was at the start of the session. 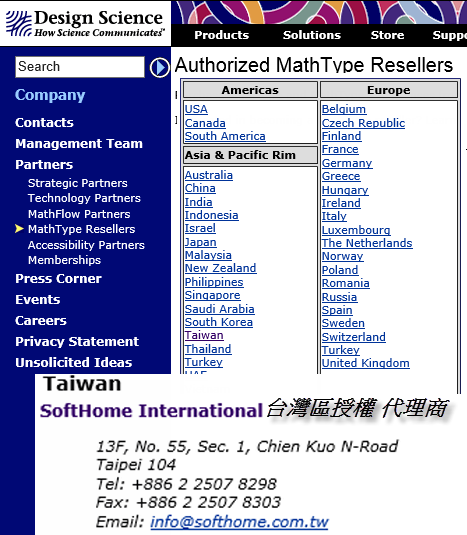 MathML 2.0 Support: MathType's MathML translators have been updated to the latest MathML Specification from the W3C. 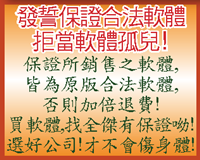 GLOBAL LIFE INSURANCE CO., LTD. PRODUCTS RESEARCH AND DEVELOPMENT DEPT. 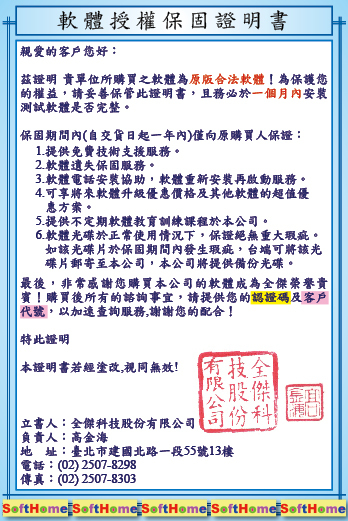 FENG SHENG TECHNOLOGY CO., LTD.